On June 28th, 2018, at the Conference Hall of the Faculty of Chemistry and Pharmacy, Sofia University “St. Kl. Ohridski ” a presentation of the main activities carried out so far within the project” Materials Networking “, funded under the call TWINNING of the Horizon 2020 Programme of the European Commission, took place. Journalists from different media were invited and attended the meeting. The meeting started with a description of the project, its objectives and major achievements presented by Prof. Georgi Vayssilov, Coordinator of the project. 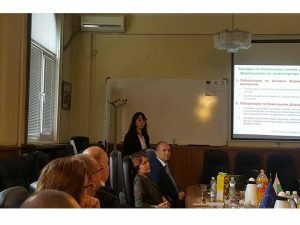 Afterwards, the main scientific topics of the research groups from the Faculty of Chemistry and Pharmacy, participating in the project, were presented. 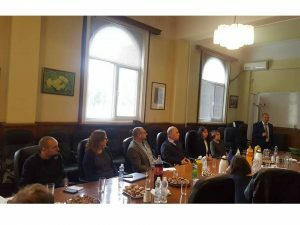 A brief discussion was held with the mass media representatives, followed by a lab tour showing three of the most advanced laboratories in the Faculty, namely the Pharmacognosy Laboratory, the Nuclear Magnetic Resonance Spectroscopy Laboratory, and the Transmission Electron Microscopy Laboratory.